Chapter 1. App structure. Next.js. HOC. Material-UI. Server-side rendering. Styles. Chapter 1: App structure. Next.js. HOC. Material-UI. Server-side rendering. Styles. You've read about the motivation for writing this book and building a web application. Motivation aside, this book will teach you how to build a modern-stack, production-ready web application from scratch. Together, we will go from 0 to over 10,000 lines of code in 9 chapters of this book. We work on Ubuntu 16.04 LTS. We skipped the 17.04 release and decided to wait for stable 18.04. Thus, we provide installation instructions specific to a Linux-based OS (for example, Ubuntu and MacOS). we use the Visual Studio editor (VS editor), which we find easier to use and automate than any other popular editor. The web application that we build in this book will allow you, via integration with Github, to use VS editor for writing documentation and books. The core technologies of the Builder Book app are React, Material-UI, Next, Express, Mongoose, and MongoDB. By the end of this chapter, we will create a static web app (no server and no database yet). To do so, we will install and integrate the first three technologies - React, Material-UI, and Next. We are building a Node app, and many of the tools that we use in this app also require Node. I suggest using Node with the help of nvm (Node Version Manager). On Linux, press Ctrl+Alt+T to open your terminal (alternatively, use the search bar to search for terminal). Node version should be 10.5.0. Once Node is installed, we can install Yarn, a manager for third-party packages (also called dependencies or modules). Whenever we need to use code developed by other developers - we add the package name and version to a package.json file and run yarn in the app's directory. More on package.json in the next section. If you're using another operating system, find specific instructions here on yarn's official website. Select your OS from the "Operating system" dropdown menu. In this book, the Yarn version is 1.7.1.
package.json is a required file at the root of any Node application. This file contains the app's metadata: app name, app version, scripts, and dependenices (described by name and version), among other properties. 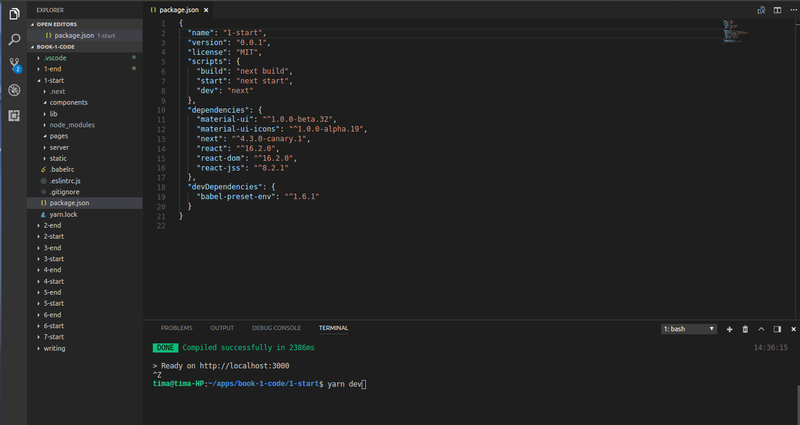 Read about working with a package.json file to learn more about metadata. Some parameters are optional (keywords, license), but some are required (name, version). You can see required metadata like name and version (version format is major.minor.patch). "dev": "nodemon server/app.js --watch server"
It's ok if you don't understand the above command. We will discuss it detail in Chapter 2 when we write our first server-side code. In this chapter and part of Chapter 2, since there is no server to start, you will run your app locally with yarn next or yarn dev ("dev": "next"). Also in Chapter 2, we'll introduce the dotenv package, which will manage most of our environmental variables (over a dozen in total) in our app. We don't pass any environmental variables inside this command. Thus, NODE_ENV and ROOT_URL default to development and http://localhost:8000, respectively. In this case, the value of NODE_ENV is explicitly set to production. Next.js will build the production app properly with NODE_ENV equal to production. In Chapter 2, we will discuss how to manage server-side environmental variables. In Chapter 8, we will discuss how to manage universally available (available on client and server) environmental variables. The next section in our package.json file is dependencies. This section contains a list of third-party packages that we need in production and development environments. To install all packages from package.json, simply run yarn in your terminal while inside the app's directory. To check if Yarn successfully installed the packages, look for a newly generated node_modules folder and yarn.lock lockfile at the app's root directory. The former folder contains the code of third-party packages, and the latter file contains the exact versions of packages and their dependencies. In the scripts section, you can specify a combination of commands or run the scripts directly from your files. From our package.json file, if you run yarn dev in your terminal, you will first run yarn next. devDependencies are dependencies that our app uses in development but not in production. Typically, developers use packages in devDependencies to run tests, compile code, or lint code locally. If you ran the yarn command inside the 1-start folder, then you successfully installed all packages we need for Chapter 1. We will discuss each installed package later in this chapter. 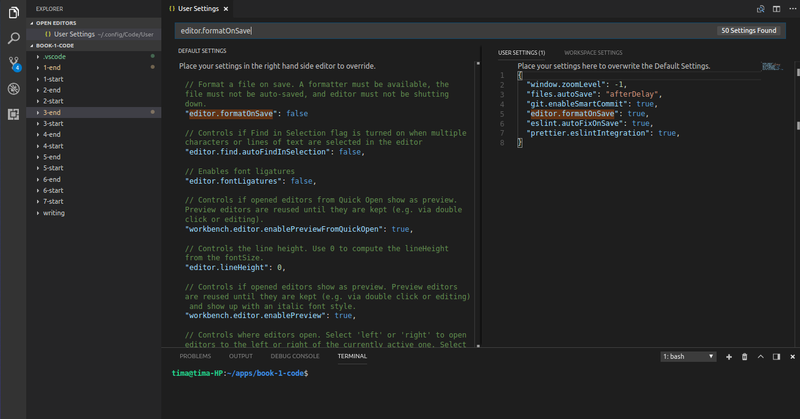 In this section, we will set up preferences for Visual Studio Code editor (VS editor) and discuss/install two extensions that help us format code: Eslint and Prettier. In addition, VS editor has many optional settings that may increase your productivity. VS editor has 2 types of settings: User settings and Workspace settings. Read more in Visual Studio's docs. The User settings are specific to your machine and will apply globally to any project you work on unless you configure Workspace settings. Since we only want to create settings for our builder book project, and not affect any settings you'd like on your own machine, we will modify the Workspace settings. "window.zoomLevel": -1 sets the zoom level to 80% - our personal preference, since we like to scroll less, especially when writing a tutorial or book. "files.autoSave": "afterDelay" saves files automatically for you, so you don't need to save your files manually. "git.enableSmartCommit": true stages changes automatically, so you don't need to stage your changes manually. "editor.formatOnSave": true detects formatters, such as Eslint, and formats your code on each save event. To format code on a save event, you have to manually save the file. Below, we will discuss the remaining 2 settings that are related to Eslint and Prettier code formatters. This setting makes Eslint apply fixes to your code when you save a file manually. Prettier is also a code formatter. Rather than install the Prettier extension in VS editor, we will use Prettier installed as a dev dependency with Eslint. We chose this set up because it is compatible with VS Editor, Sublime Text 3, and Atom, in case you prefer one of the latter two code editors over VS Editor. We included the .eslintrc.js file with all necessary rules in our 1-end folder. To make Eslint and Prettier work properly, we need to install the missing packages that they rely on. A list of all Eslint rules is in the official docs. Check out, for example, the max-len rule. You may have noticed that we installed the eslint-config-airbnb package and extended Eslint with extends: 'airbnb'. In addition to rules that we specified in .eslintrc.js, we use rules from the eslint-config-airbnb package. Now that you've properly installed and configured Eslint and Prettier, let's test them. We'll start with testing Eslint.